The views surrounding Bend don't exactly conjure notions of traditional farmland. Snowy mountains frame open vistas dotted with gnarled juniper trees and sagebrush. By day, the landscape is blanketed under a blazing sun, while cold nights bring relief beneath bright stars. Despite these extremes, agriculture thrives, thanks to the hard work of dedicated farmers and ranchers. Irrigated fields support bountiful crops at Fields Farm and Mahonia Gardens. Farmers' markets, most notably at NorthWest Crossing, bustle with people buying local produce, dairy, eggs, meat and honey. Visit places like the Great American Egg to learn about the business of raising chickens and Jackson's Corner for a delicious sample of what eating local tastes like. 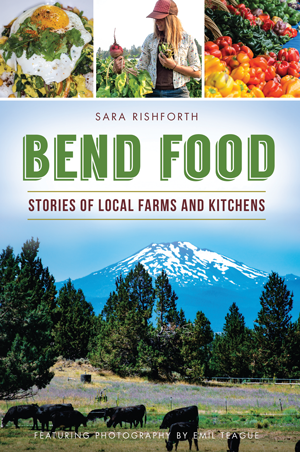 Author Sara Rishforth goes behind the scenes to present the story of the local farm-to-table movement. Sara Rishforth, her husband and their fuzzy orange cat, Yam, live in Bend, Oregon. She loves good food and adores her KitchenAid mixer. Sara grew up in Greenville, South Carolina, and worked her way west to Alaska, where she wrote for Alaska’s Best Kitchens magazine before moving to Oregon in 2010. She has previously published two novels and was a winner of the 2013 Central Oregon Writers Guild Literary Harvest, Memoir Category. Follow her culinary and writing adventures at www.sararishforth.com.